To give you a superior joint compound adhesion and maximum protection for a professionally finished corner, Clinch-On covers its paper faced tape-on cornerbead with a specially engineered paper using a paperto-steel lamination process that eliminates delamination. Our durable fiber specially engineered paper prevents balling (fuzzing) when sanding. For superior protection, Clinch-On laminates its uniquely formulated paper to the Clinch-On proprietary coated steel. Clinch-On manufactures its cornerbead to meet a rigid set of specifications using top quality, corrosion-resistant, proprietary coated steel. Clinch-On warrants that its paper-faced tape-on cornerbead will not edge crack when applied to a sound structure built on a permanent foundation using Clinch-On recommended application techniques. Subject to use under normal conditions, Clinch-On paper-faced tape-on cornerbead is guaranteed for 30 years from the date of installation. Clinch-On shall not be responsible for any loss resulting from installation practices not in accordance with Clinch-On recommended application techniques; damage caused by contact with water during delivery or while stored at the job site; failure of the owner to maintain the building with reasonable care and abnormal conditions including abuse, neglect, catastrophe and intermittent or prolonged exposure to water. Clinch-On makes no warranties other than that which is explicitly stated herein. Our drywall trim products. Special length cuts available upon request with ten (10) day advanced notice. 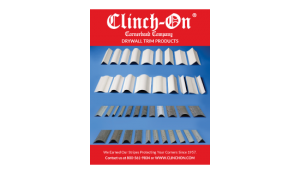 Headquartered in Orange, CA, Clinch-On Cornerbead Company has been manufacturing drywall corner trims since the mid 1950's. 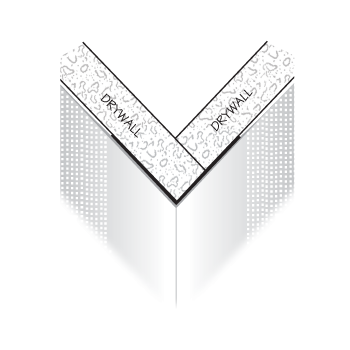 We manufacture high quality Bullnose and traditional cornerbeads, paper faced nail-on and tape-on profiles, drywall accessories such as corner caps and The Original Cornerbead Tool®, and bare metal and paper faced trims. Our support available to help you Monday to Friday, 6:30am to 5pm Pacific Standard Time.